Arlington Montessori Action Committee is an organization of Montessori parents and educators whose primary goal is to promote and expand Montessori education. We are advocates for Montessori and are working for its continued support and expansion in Arlington Public Schools. APS’s Montessori program promotes self-directed learning, healthy self-discipline, and good citizenship. Montessori children learn in an environment that is community-centered, where they have strong ties to adults at school, and receive differentiated instruction from a variety of resources both inside and outside the classroom, including other children. Montessori works for children of diverse backgrounds and abilities, and APS’s Montessori classrooms exhibit this diversity. In short, the Montessori program meets several of the goals in APS’s Strategic Plan, including narrowing the achievement gap, rising achievement for all students, and responsive education. 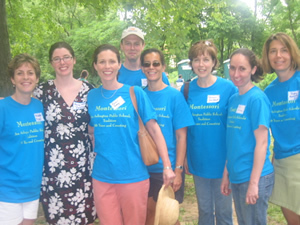 The Arlington Montessori Action Committee (AMAC) marks its 10th anniversary this December as a non-profit organization dedicated to supporting and growing Montessori education in Arlington. We have much to celebrate. This year, Drew Model School added its 8th Lower Elementary classroom. The class will start as a Kindergarten-first grade class and will grow by fall 2018 to a full Lower Elementary classroom with first, second, and third grades. This year, Montessori Middle School program at Gunston has the highest number of students and teachers: 80 students and four full-time Montessori teachers providing Montessori instruction across all main content areas. After a decade of advocacy by AMAC, we are looking forward to the first standalone public Montessori school in Virginia, which will open its doors to Arlington students in fall 2019. A standalone Montessori school represents the opportunity for a Montessori experience from the moment our students walk through the doors until the moment they leave for the day. All teachers, assistants, administrators, and specialists will support the Montessori philosophy. A standalone school allows our program to be “unapologetically committed to leading with a Montessori identity,” while “translating public school mandates into Montessori practice,” characteristics of the most successful Montessori schools as described by The National Center for Montessori in the Public Sector. We fully anticipate our Montessori school will be a model for the state, and for the country. Work with Arlington Public Schools to create a new school at the Henry site with the flexibility to maximize its Montessori culture. Lobby the Virginia Board of Education to create a Montessori teaching credential so highly qualified Montessori-trained teachers can more readily move into the public school system. Collaborate with the Virginia Montessori Association to promote public and private Montessori education in Arlington and across Virginia. Hold Montessori parent education sessions to help inform parents about this unique learning style. Build community among Montessori educators and families across Arlington by hosting family goings out and other events. AMAC’s success depends on you. There are so many ways you can be a part of the effort. Join our organization by going to ArlingtonMontessori.org and paying just $12 in annual dues. Join our listserv by sending an email to MontessoriAction-subscribe@yahoogroups.com. If you are committed to public Montessori education for your child or because it works for children of diverse backgrounds and abilities, and if you want our school system to expand the curriculum to its full potential, you have a voice. We meet monthly and sponsor year-round Montessori events in Arlington. To find out more, please become a member, join our Yahoo Listserv, or contact us directly. Become AMAC’s parent representative for your school. Contact us for more information. Then click on "Sign up for Special Lists"
This will sign you up only for the Montessori School Talk list -- it doesn't mean you have a School Talk account and you wouldn't be getting any other School Talk messages unless you have signed up for School Talk separately.